Not to be confused with Lake Forest College. During the Baptist State Convention of 1833 at Cartledge Creek Baptist Church in Rockingham, North Carolina, establishment of Wake Forest Institute was ratified. The school was founded after the North Carolina Baptist State Convention purchased a 615-acre (2.49 km2) plantation from Calvin Jones in an area north of Raleigh (Wake County) called the "Forest of Wake". The new school, designed to teach both Baptist ministers and laymen, opened on February 3, 1834, as the Wake Forest Manual Labor Institute. Students and staff were required to spend half of each day doing manual labor on its plantation. Samuel Wait, a Baptist minister, was selected as the "principal", later president, of the institute. Wait Chapel located on the Hearn Plaza (or the 'Upper Quad'). In 1838, the school was renamed Wake Forest College, and the manual labor system was abandoned. The town that grew up around the college came to be called the town of Wake Forest. In 1862, during the American Civil War, the school closed due to the loss of most students and some faculty to service in the Confederate States Army. The college re-opened in 1866 and prospered over the next four decades under the leadership of presidents Washington Manly Wingate, Thomas H. Pritchard, and Charles Taylor. In 1894, the School of Law was established, followed by the School of Medicine in 1902. The university held its first summer session in 1921. Lea Laboratory was built in 1887–1888, and was listed on the National Register of Historic Places in 1975. The leading college figure in the early 20th century was William L. Poteat, a gifted biologist and the first layman to be elected president in the college's history. "Dr. Billy" continued to promote growth, hired many outstanding professors, and expanded the science curriculum. He also stirred upheaval among North Carolina Baptists with his strong support of teaching the theory of evolution but eventually won formal support from the Baptist State Convention for academic freedom at the college. In 1946, as a result of large gifts from the Z. Smith Reynolds Foundation, the entire college agreed to move to Winston-Salem, a move that was completed for the beginning of the fall 1956 term, under the leadership of Harold W. Tribble. Charles and Mary Reynolds Babcock (daughter of R. J. Reynolds) donated to the college about 350 acres (1.4 km2) of fields and woods at "Reynolda", their estate. From 1952 to 1956, fourteen new buildings were constructed on the new campus. These buildings were constructed in Georgian style. The old campus in Wake Forest was sold to the Baptist State Convention to establish the Southeastern Baptist Theological Seminary. On April 27, 1962, Wake Forest's board of trustees voted to accept Edward Reynolds, a native of the African nation of Ghana, as the first black full-time undergraduate at the school. This made Wake Forest the first major private university in the South to desegregate. Reynolds, a transfer student from Shaw University, later became the first black graduate of the university in 1964, when he earned a bachelor's degree in history. Later, he went on to earn master's degrees at Ohio University and Yale Divinity School, and a PhD in African history from the University of London. He became a professor of history at the University of California, San Diego, and author of several history books. The thirteenth president of Wake Forest is Nathan O. Hatch, former provost at the University of Notre Dame.. Hatch was officially installed as president on October 20, 2005. He assumed office on July 1, 2005, succeeding Thomas K. Hearn, Jr., who had retired after 22 years in office. On March 17, 1978, President Jimmy Carter made a major National Security address in Wait Chapel. Twice the school has hosted presidential debates. The first was between then-Vice President George H.W. Bush and Governor Michael Dukakis on September 25, 1988. The second matched then-Governor George W. Bush against Vice President Al Gore on October 11, 2000. Both debates were hosted in Wait Chapel. Admission statistics for the class of 2021 are as follows: 13,000 applications were received. Representing 55 percent of the incoming class of 1350 freshmen, 750 members of the new class were enrolled through the early decision process – a 15 percent rise in applications than the previous year. Acceptance to Wake Forest has been offered to 25 percent of those who applied through the regular decision process. 54 percent of the class is composed of women. 34 percent are students of color. 22 percent come from North Carolina while 7 percent are international applicants. In order, the top eight states represented in the admitted class are North Carolina, Florida, New Jersey, Georgia, New York, California, and Virginia (with at least one person admitted from each of the fifty states). Students residing in 48 different countries have been offered admission. 61 percent of admitted applicants who attend schools that calculate class rank are in the top 5 percent of their class, with 87 percent within the top 10 percent. Prior to her passing, poet, author and civil rights activist Maya Angelou, Reynolds Professor of American Studies, taught at the university from 1982 to 2014. Among her many awards, she was honored with the Presidential Medal of Freedom in 2010. In addition to MD, PhD and MS degrees (including an MS for physician assistants), the School of Medicine has five joint-degree programs, nurse anesthesia and medical technology teaching programs, and is the clinical site for 10 Forsyth Technical Community College programs. 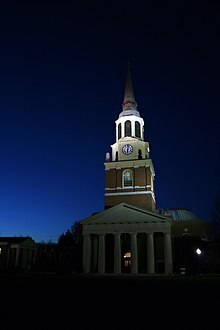 In the 2019 U.S. News & World Report America's Best Colleges report, Wake Forest ranked tied for 13th in terms of "Best Undergraduate Teaching", tied for 27th overall among national universities, tied for 354th overall among global universities, with the School of Law tied for 32nd in the country, and the School of Medicine tied for 52nd best in research and tied for 61st best in primary care. The part-time MBA program was ranked by U.S. News in 2016 as tied for 19th best in the U.S., but not ranked in 2019. The nursing anesthesia program was tied for 10th. With 25 chapters, fraternity and sorority membership consists of around 45 percent of the student population. Wake Forest requires that all new members of fraternities and sororities complete at least one semester of full-time studies, so the primary recruiting time is during the spring semester. Fraternities on campus: Alpha Epsilon Pi, Alpha Phi Alpha, Alpha Sigma Phi, Chi Psi, Kappa Alpha Order, Kappa Alpha Psi,Lambda Chi Alpha, Omega Psi Phi, Pi Kappa Alpha, Sigma Alpha Epsilon, Sigma Chi, Sigma Pi, and Theta Chi. Wake Forest is also home to the Sigma Delta chapter of Order of Omega, an honor society for members of Greek organizations. Members are selected from the top three percent of Greeks on campus based on high standards in the areas of scholarship, leadership, and involvement within their respective organization and within the fraternity/sorority, campus and local communities. Students are guaranteed housing for four years. As of 2010[update], students were required to live on campus for their first three years as a full-time enrolled student. Founded in 1923, Wake Forest Student Government (known as SG) works under a semi-Presidential system. Four executive officers (student body president, speaker of the House, secretary and treasurer) are elected each spring. The president appoints a chief of staff. The executive officers coordinate with the Cabinet, formed by the co-chairs of the six standing committees. The executive committee and Cabinet work with members of the General Assembly to pass legislation and advocate on behalf of students. In 2009, President Nathan Hatch outlined in his strategic plan a campus culture in which personal and career development would become an integral component of the undergraduate student experience. Later that year, he created a cabinet-level position and appointed Andy Chan as the vice president for personal and career development. "Rolling the Quad" is a WFU tradition that is done after major victories in athletic competition. Originally, Wake Forest's athletic teams were known as The Old Gold and Black or the Baptists, due to its association with the Baptist Convention (from which it later separated itself). However, in 1923, after a particularly impressive win against the Duke Blue Devils, a newspaper reporter wrote that the Deacons "fought like Demons", giving rise to the current team name, the "Demon Deacons." Wake Forest has won a total of nine national championships in five different sports. Wake Forest is sometimes referred to as being a part of "Tobacco Road" or "The Big Four", terms that refer to the four North Carolina schools that compete heatedly against each other within the ACC; these include Duke, North Carolina, and North Carolina State, as well as Wake Forest. Noah Rubin played for Wake Forest; he had won the 2014 boys singles championship at Wimbledon, and the US 2014 boys' national championships in singles and doubles. In 2014–2015 for Wake Forest he was an All-American and the runner-up in the 2015 NCAA singles championship. On May 22, 2018, the Wake Forest Men's Tennis team won its first ever NCAA National Championship. This feat was accomplished on their home courts, as they defeated the Ohio State Men's Tennis team 4–2. Wake Forest had been ranked as the number one team for most of the season leading up to the tournament. There are over 225 chartered student organizations of all sorts. Student sports organizations are highly visible on campus. Special interest organizations range from the academic, such the Model United Nations team, to the artistic, such as the handbell choir. In spring of 2006, the Mock Trial team was notable in qualifying for the national tournament while only in its 2nd year in operation. Religious organizations are also numerous. Both the College Republicans and College Democrats have active chapters at the university. Historic student organizations such as the Philomathesians, an artistic literary magazine, are also present. Students are entertained by numerous performing groups, including The Lilting Banshees Comedy Troupe, The Living Parables Christian Drama Troupe, and The Anthony Aston Players. The Office of Student Engagement, oversees all student organizations and fraternities and sororities. Student Engagement also organizes leadership oriented student activities such as CHARGE (Formerly called LEAD), a semester long course in campus leadership. Wake Forest University offers an Army ROTC program. In 2006 the Army ROTC program was awarded the MacArthur Award by the United States Army for having the best medium-sized ROTC battalion in the nation. There are about sixty cadets in the program, and about half of each military science class finishes Leadership Development Advanced Camp (LDAC) as a "Distinguished Military Graduate", the top 20 percent of ROTC graduates. On April 27, 1962, the board of trustees voted to end racial segregation at Wake Forest, which became the South's first major private university to integrate. In the fall of 1962, Ghana native Ed Reynolds became the first full-time black undergraduate student to enroll. In 2012–2013, Wake Forest's celebration, "Faces of Courage", marked the 50th anniversary of Wake Forest's decision to integrate and how it shaped the university. On Feb. 23, 1960, ten Wake Forest students joined eleven students from Winston-Salem State Teachers College (present-day Winston-Salem State University) for a sit-in at Woolworth's lunch counter in downtown Winston-Salem. The students' non-violent protest, along with other protests in Winston-Salem, led to the desegregation of the city's restaurants and lunch counters on May 23 of that year. The Office of Minority Affairs was formed in 1978 and later became the Office of Multicultural Affairs. Wake Forest also added an Office of Diversity & Inclusion, an LGBTQ Center, and a Women's Center. Wake Forest is a founding member of WinstonNet, a non-profit organization of educational and municipal institutions in Winston-Salem that, among other things, provides a gigabit ethernet based regional point of presence (or, rPOP) for the North Carolina Research and Education Network. The university is a member of the Inter-university Consortium for Political and Social Research (ICPSR), providing access to a large library of data files, and of EDUCAUSE, a national consortium of colleges and universities concerned with computing issues. North Campus consists of the T.K. Hearn Plaza, better known as "the quad", which holds the six upperclassmen residential buildings, the US Post Office, Subway restaurant, book/office supply store, clothing/athletic store, and Wait Chapel. Wait Chapel serves multiple functions. Its auditorium serves as an area for prayer, ceremonies, concerts, and certain guest speakers. The classrooms at Wait Chapel house the offices and classrooms for the Divinity School and the Religion Department. The School of Business established a satellite campus in Charlotte, North Carolina, in 1995; in January 201, it moved into a 30,000-square-foot (2,800 m2), award-winning facility on North College Street in Uptown. The university owns international properties in Italy, Austria, England, and Nicaragua. In 1974, Wake Forest purchased the building that formerly housed the American Consulate in Venice and named it Casa Artom in honor of Camillo Artom, a professor at the Baptist Medical Center until 1969. Casa Artom is a two-story building facing the Grand Canal. It is flanked by the Palazzo Venier dei Leoni, which houses the Peggy Guggenheim art collection, and the 15th century home Ca'Dario. Each fall and spring semester, a group of Wake Forest students and a resident professor live and study together here. In 2008, Karyn and Tom Dingledine provided a donation that enabled Wake Forest to purchase Casa Dingledine, a 6,600-square-foot (610 m2) conference center on 5 acres (2.0 hectares) of land with a view of Lake Managua. The facility provides a venue for the exchange of ideas between and among not only Wake Forest constituents, but also the university's Nicaraguan partners, other academic institutions and corporate entities. The center is critical to the mission of the Nicaragua Nexus, which is to accomplish the Wake Forest motto of Pro Humanitate by working with Nicaraguans to enhance their quality of life through collaborative partnerships with local and international organizations in Nicaragua, while providing transformational experiences for students and faculty. Casa Dingledine was dedicated in February 2011. Wake Forest students regularly get involved at Reynolda House through internships, volunteer opportunities, and academic research. In 2010, Reynolda House and Wake Forest partnered on a first-year student orientation project that uses the museum's masterpiece by Frederic Church, The Andes of Ecuador, as the focal point of the summer academic experience. General admission to the museum is free to students and University employees. The 129-acre (52-hectare) property that comprise Reynolda Gardens of Wake Forest University was once at the center of Reynolda, the early 20th-century estate of Mr. and Mrs. R. J. Reynolds, and included a lake, golf course, formal gardens, greenhouses, and woods. Although many changes have occurred to the landscape over the past century, this preserve serves as a learning center for topics related to horticulture, environmental sciences, and landscape history. Wake Forest students and faculty engage in research throughout the preserve. The public is invited to participate in a wide variety of learning experiences, including classes, workshops, summer camps, and special events. Adjacent to the Wake Forest campus, Reynolda Village is home to stores, restaurants, services and offices. Now owned and operated by Wake Forest University, the buildings were originally part of the 1,067-acre (432-hectare) estate of the R.J. Reynolds family. These buildings were modeled after an English Village and included dairy barns, a cattle shed, school, post office, smokehouse, blacksmith shop, carriage house, central power and heating plant, as well as cottages to house the family's chauffeur and stenographer, the village's school master, and the farm's head dairyman and horticulturist. The present-day village has a wide range of shops specializing in home furnishings and designer fashions, as well as art galleries, fitness studios, and a full-service day spa. The Reynolda historical district, including Reynolda Village, serves as an educational, cultural, and community complex for the Winston-Salem community. Built as the world headquarters for Reynolds Tobacco Company, RJR Nabisco donated the more than 500,000-square-foot (46,000 m2) building to Wake Forest University in 1987. Now known as the University Corporate Center, the building is located off Reynolds Boulevard, near campus, and houses the following University offices: Information Systems, Finance Systems, Procurement Services, and Financial and Accounting Services. Aon Consulting, BB&T, and Pepsi are also tenants. The opening of Wake Forest Biotech Place in February 2012 marked a milestone in development of Wake Forest Innovation Quarter, based in downtown Winston-Salem and formerly known as Piedmont Triad Research Park. Operated by Wake Forest Baptist Medical Center, Wake Forest Biotech Place is a 242,000-square-foot (22,500 m2) multipurpose biotechnology research and innovation center space that is the present-day home of several School of Medicine departments doing pioneering research, as well as private companies. In December 2012 the Wake Forest Baptist Medical Center formally launched its new commercialization enterprise, Wake Forest Innovations. Located in the Innovation Quarter, Wake Forest Innovations brings together technology asset management functions with resources to support scholarship, invest in the innovative potential of its academic and clinical communities and help translate ideas and discoveries into commercial products and services for both the Medical Center and Wake Forest University. Michael Maxey, president of Roanoke College. Undergraduate degree in history and master's degree in counselor education from WFU. ^ "The Meaning of a Motto". www.magazine.wfu.edu. Retrieved January 12, 2012. ^ "Marker: K-42". Ncmarkers.com. Retrieved 22 September 2018. ^ "Winston-Salem Journal". Winston-Salem Journal. Archived from the original on 1 August 2003. Retrieved 16 October 2014. ^ "Office of the president: Nathan O. Hatch". www.president.wfu.edu. Retrieved March 16, 2019. 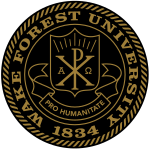 ^ "From the Forest - Wake Forest University". fromtheforest.admissions.wfu.edu. Retrieved 22 September 2018. ^ "WFU – Admissions – Student Financial Aid – Merit-Based Scholarships – Introduction". Wake Forest University. Archived from the original on 6 June 2002. Retrieved 13 September 2013. ^ "Centers and Institutes – Office of the Provost". Wake Forest University. Archived from the original on 2017-09-05. Retrieved 5 September 2017. ^ "U.S. News Best Colleges Rankings - Wake Forest University". U.S. News & World Report. Retrieved November 8, 2015. ^ "Melissa Harris-Perry". ELLE. Retrieved 22 September 2018. ^ "Melissa Harris-Perry - Politics and International Affairs". college.wfu.edu. Retrieved 22 September 2018. ^ a b c "U.S. News Best Grad School Rankings - Wake Forest University". U.S. News & World Report. Retrieved September 8, 2016. ^ "Fact Book 2013" (PDF). Wake Forest Baptist Medical Center. Archived from the original (PDF) on 2013-05-15. Retrieved 9 July 2013. ^ "Wake Forest University - U.S. News Best Grad School Rankings". U.S. News & World Report. Retrieved 2 April 2019. ^ "Sigma Pi Alpha Nu". Groups.wfu.edu. Archived from the original on 2013-06-15. Retrieved 2013-08-24. ^ "OrgSync Organization Template". Campuslifeleadership18642.orgsync.com. Archived from the original on 2013-10-11. Retrieved 2013-08-24. ^ "Campus Rec Home - Campus Rec". Campus Rec. Retrieved 22 September 2018. ^ "Wake Forest celebrates transformation of Reynolds Gym into Wellbeing Center". News.wfu.edu. 29 March 2018. Retrieved 22 September 2018. ^ "Studying in London - Study Abroad - Wake Forest School of Law". studyabroad.law.wfu.edu. Retrieved 22 September 2018. ^ "AN AMERICAN FAMILY". Vanity Fair. April 4, 2007. Retrieved 22 September 2018. ^ "President Maxey's Biography - Roanoke College". Roanoke.edu. Retrieved 22 September 2018. ^ "Robert Wilkie sworn in as new Veterans Affairs secretary". Abcnews.go.com. July 30, 2018. Retrieved 22 September 2018. 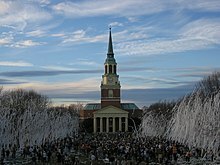 Wikimedia Commons has media related to Wake Forest University.